Despite tourbillon wristwatches being common, a tourbillon regulator inside an old fashioned luxury sports watch, as opposed to something in carbon composite, is uncommon. So the Overseas Tourbillon is fairly unusual (with only one comparable competitor; more on that below). And it is even more unusual in being a value proposition in its segment, priced a shade over US$100,000. While the Overseas range is a mixed bag in terms of design, the tourbillon works, both in style and perhaps more importantly, proportion. 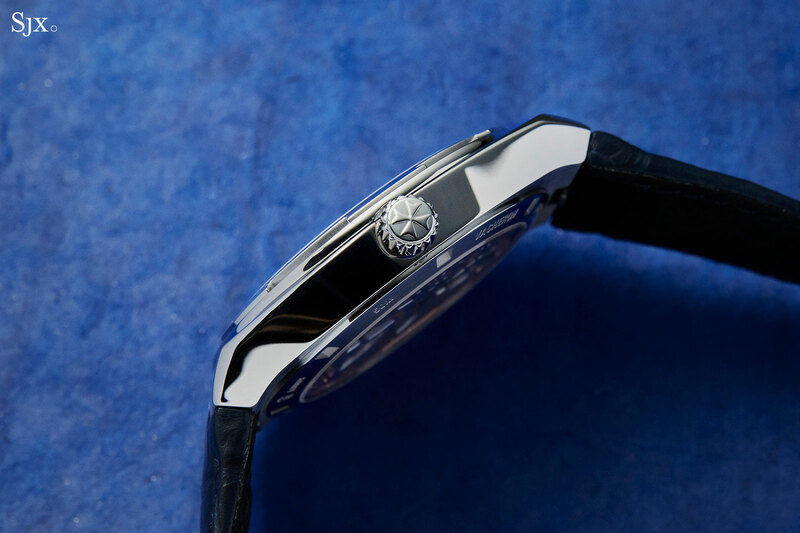 Entirely in steel, the watch is typical Overseas, with a prominent bottle cap-esque bezel on a tonneau-shaped case. It’s a fuss-free watch – just two hands plus an exposed tourbillon regulator – that doesn’t distract. Rated for 50m of water resistance, the case is a generous 42.5mm in diameter – it is big – but 10.39mm high. It’s wide but thin, giving it an elegant profile on the wrist. Admittedly the case is not sub-10mm thin, but it is slim enough, helped by the inward sloping case flanks. Notably, the tourbillon is one of just three watches in the Overseas range with the same wide-but-thin proportions, the other two being the perpetual calendar and time-only Ultra-Thin, which are both powered by the same cal. 1120. The three models are unquestionably the most elegant of the Overseas line, while also being equipped with the most sophisticated movements (and the correspondingly highest price tags). The case is finely finished, particularly on the bevelled edges of the lugs shaped like half a Maltese cross; the edges are mirror finished while the top surfaces are brushed. Another impressive element is the one-piece bezel, which still manages two distinct levels and finishes – polished for the top and circular brushing for the base. 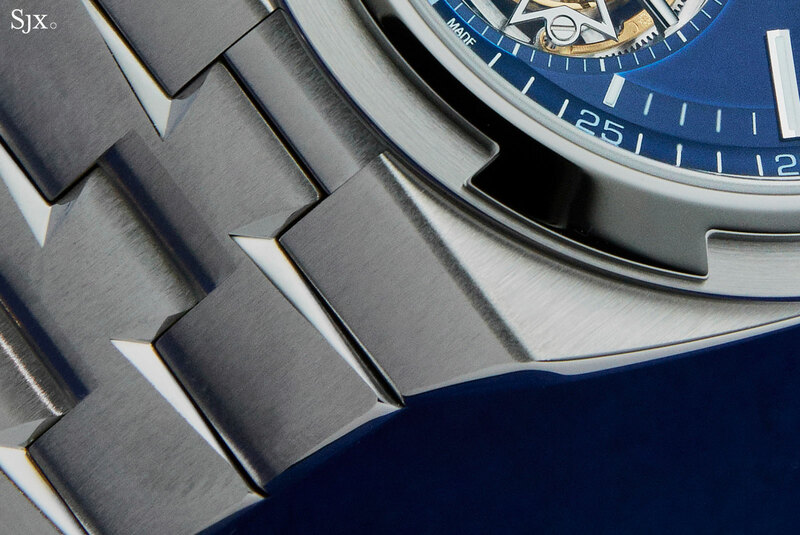 But the case design is not as complex as that of its rivals, namely the Royal Oak and Nautilus, so the case finishing is correspondingly simpler. The upside of that is a more robust surface; the Overseas avoids the exquisite but delicate case finishing of its rivals. As with other Overseas watches, the case is equipped with a quick release mechanism for the lugs, allowing easy interchangeability between straps; a tiny tab on the back of the bracelet or strap releases it in an instant. Consequently the watch is delivered with three strap options: a steel bracelet, and straps in crocodile and rubber. The dial is good looking and executed as expected for a high-end watch, with both the hands and hour markers done in 18k white gold. Though the colour is the stereotypical dark blue of a luxury sports watch, it is a beautifully executed shade in translucent glossy lacquer. Because of the semi-transparent lacquer, there is a faint nuance to the dial colour, especially around the edges of the aperture for the tourbillon. The only thing that I would change about the dial is the size of the logo letters, which feel too big, and span too much of the dial. The cal. 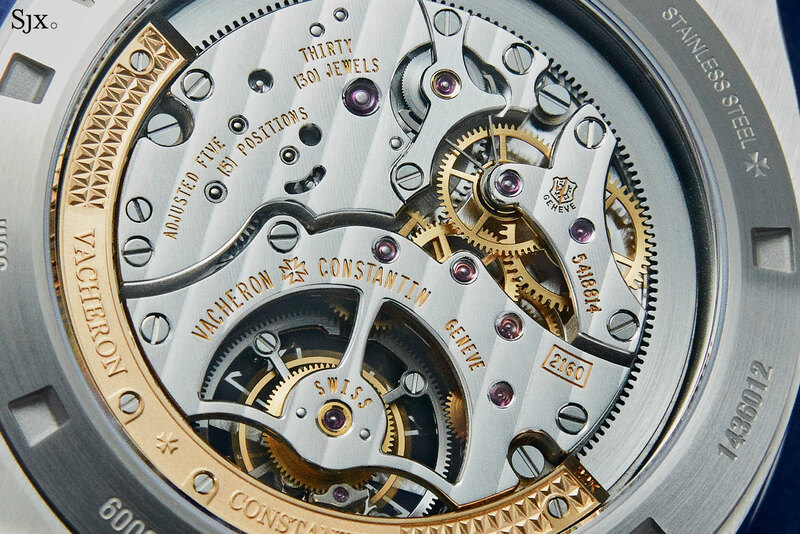 2160 movement inside is a recent favourite of Vacheron Constantin. Having made its debut in 2018, the movement has been installed in models across almost all of Vacheron Constantin’s lines, including the FiftySix. It’s easy to see why the cal. 2160 is widely used. 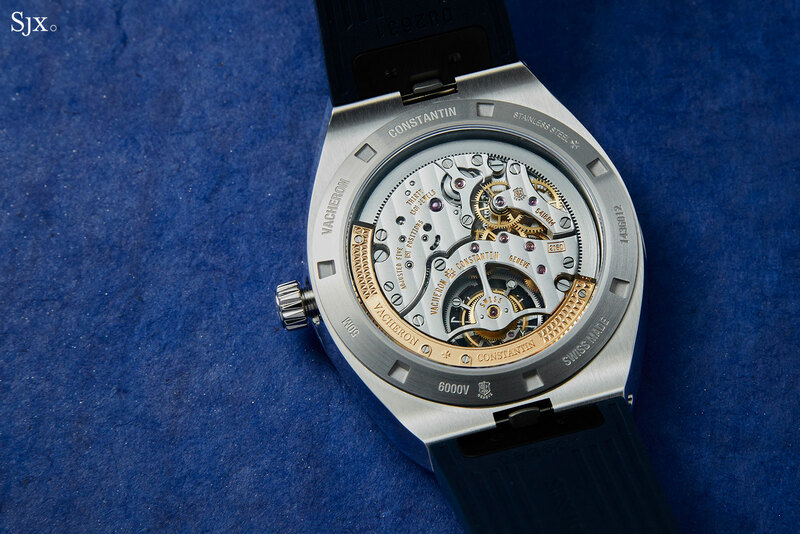 The movement is thin – just 5.65mm high in fact – visually appealing and also self-winding. 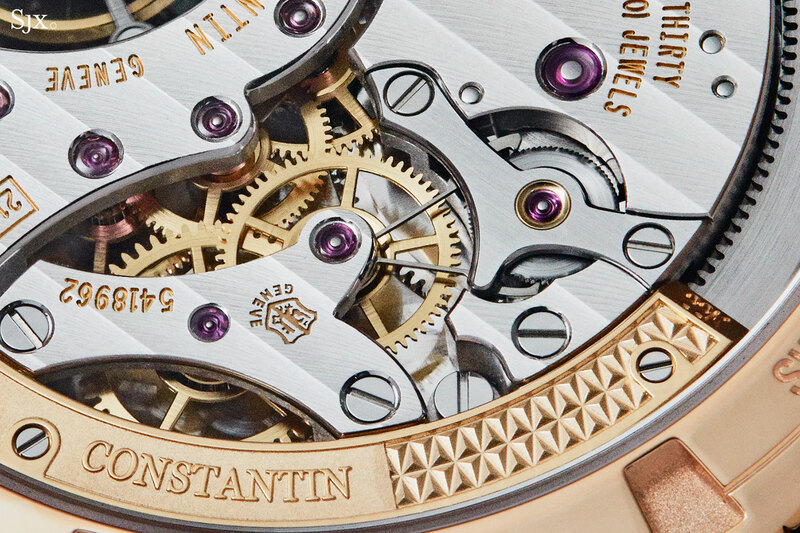 Thanks to a peripheral rotor weighted with an engraved 22k gold rim, all of the movement can be seen. The bridges are attractively shaped, with enough inward and outward angles in their outlines to make them interesting. 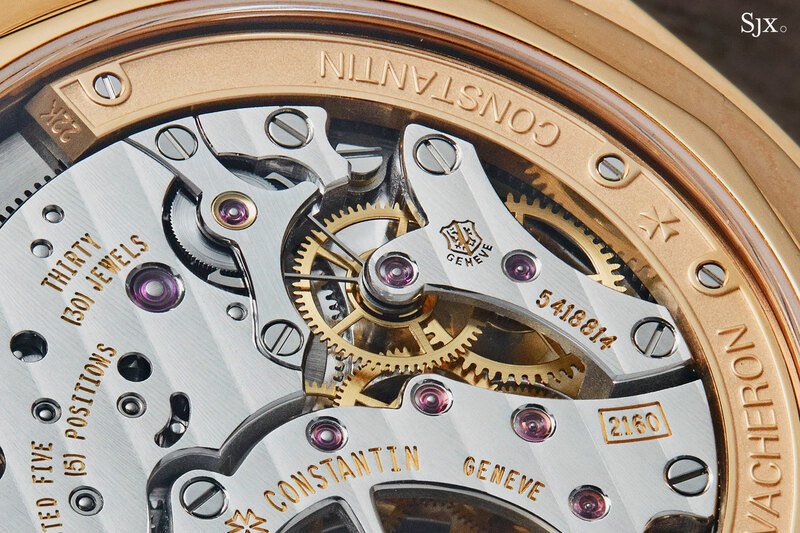 Despite the refined looks and Poincon de Geneve, or Geneva Seal, hallmark, the movement is also protected from magnetism, as are all watches in the Overseas line. Hidden under the case back is a soft iron ring that forms a Faraday cage, protecting the movement from magnetism. The degree of magnetism resistance is about 300 Gauss, five times the 60 Gauss of a non-protected “magnetism resistant” wristwatch according to the ISO 764 standard, more than adequate for everyday exposure. But because the cage doesn’t enclose the entire movement – which would have eliminated the view from the back – the magnetism resistance is less than the 1000 Gauss of a complete soft iron cage. Exposed at one o’clock on the back is the Magic Lever winding mechanism that’s wound by the large, toothed ring of the peripheral rotor. Invented by Seiko in 1959, the Magic Lever has become popular for its robust simplicity and efficiency. Though it occupies a relatively large footprint, the Magic Lever is thin, making it ideal for a movement that’s slim but quite wide. The movement is finely finished, with all elements have been dealt with properly and neatly. That includes the large components, like the bridges with mirror polished bevels, and the small – all the wheels have circular grained faces and bevelled spokes, while the screw heads have chamfered slots and edges. While not done in an artisanal manner (the inward angles of the bridges aren’t pointy sharp for instance), the degree of movement decoration is on par with its rivals, which means it’s as good as it gets in this category. Like the Overseas perpetual calendar and Ultra-Thin, the tourbillon cuts a grateful profile on the wrist because of its proper proportions. Unlike the other two, it is available only in steel, usually the ideal metal for a sports watch, and powered by a bona fide in-house movement. The Overseas Tourbillon is a well executed product in all tangible aspects, and it wears well. 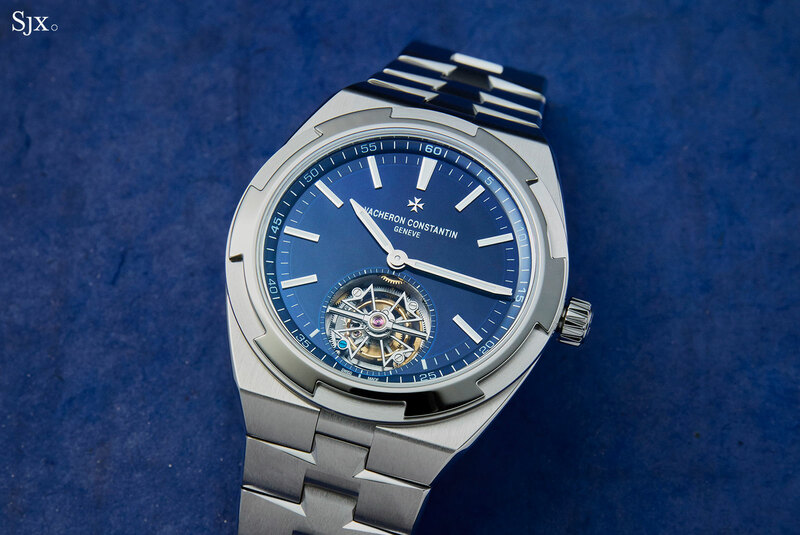 Its only weakness is the short history of the Overseas line, which was unveiled only in 1996, although the first Vacheron Constantin luxury sports watch, the 222, debuted in 1977. 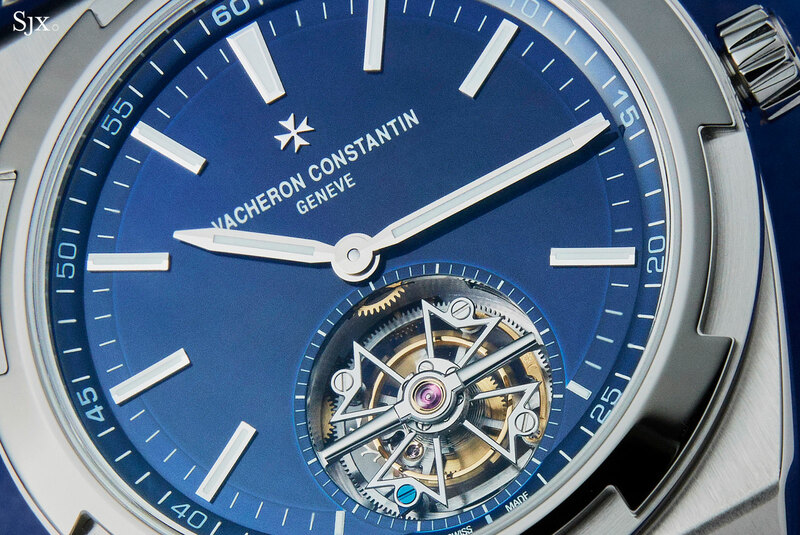 The Vacheron Constantin Overseas Tourbillon in steel (ref. 6000V/110A-B544) is priced at US$103,000 or S$159,000. It’ll be available at boutiques and retailers starting in the third quarter of 2019. Vacheron Constantin introduces the Malte Tourbillon Openworked in pink gold, having refined the skeleton movement.